The "Light Up the Night" plastic canvas coasters feature a very pretty design. They are decked out with candy canes and strings of Christmas lights. They may not add real light to the home, but they will surely light up each face that beholds them with a smile. Every home needs coasters to protect wood furniture and to prevent those awful rings left behind from drink glasses. It is really very fun to have seasonal coasters to offer our guests and to add to our own holiday decorations too. Plastic Canvas is the easiest needlework craft. 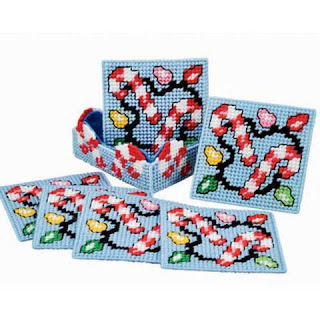 The combination of an easy Christmas craft and the need for coasters, makes these pretty candy canes and lights coaster kits very popular. As with any Christmas craft kit, you could make these coasters for your own home, to give as gifts, or you could even give the kit as a gift to a crafty friend. You can see for yourself how pretty these coasters are and how beautifully they will add to your Christmas decor, as well as serving a very practical purpose. The candy canes and bulb Christmas lights are reminiscent of childhood for many of us. They remind of the days when Christmas trees were decorated with strings of bulb light and candy canes were hung on the tree to the delight of every child in the household. The plastic canvas kit includes enough mesh canvas and acrylic yarn to make 6 coasters plus the coaster holder. Such a delightful set of handmade coasters are sure to bring joy to everyone at first sight. This is an adorable kit. Love the Christmas design on this coaster set. Oh, I love Light Up the Night coasters. Plastic canvas needlepoint is such fun to do and perfect to add that delightful charm for Christmas. Even the holder is charming.